"My daughter has made fantastic progress in a matter of only a few months. It is a joy to watch her come alive when playing her guitar. I have seen Her enthusiasm grow throught the structured and motivating approach which is always tailored to her individual needs. I would highly recommend Rick to any parent or individual. "I'd just like to say I'm really happy with my son's progress and am glad that we went with you as his tutor. It is clear that as a gigging musician your approach and enthusiasm for music carries through into your teaching". �Dude, great lesson, loved it, you picked up on everything I�d hoped for and showed me how to improve my playing and all in an hour lol, looking forward to next week�Roj. "Being new to bass, I wanted to attain a certain levelwithin a set time. Each lesson was tailored to suit myneeds in a methodical manner whilst developing mytechnique for feel. 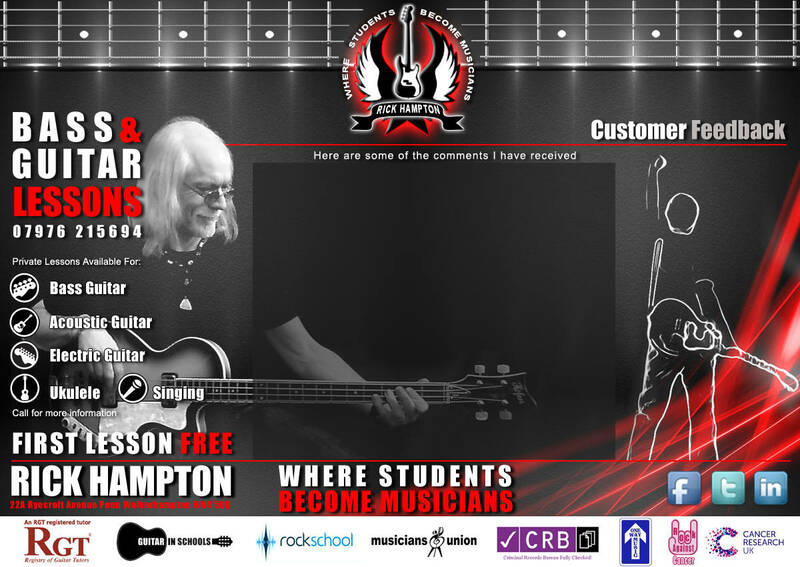 If you want to become a bass playerwith the ability of �holding your own� within a band or just for recreation, book lessons from Rick and no doubtyou�ll have a lot of fun along the way�.